Renganayagi Varatharaj College of Engineering, Virudhunagar has advertised in the DINAMALAR newspaper for recruitment of Assistant Professor Plus Non-Faculty jobs vacancies. Interested and eligible job aspirants are requested to apply on or before 05th July 2018. Check out further more details below. 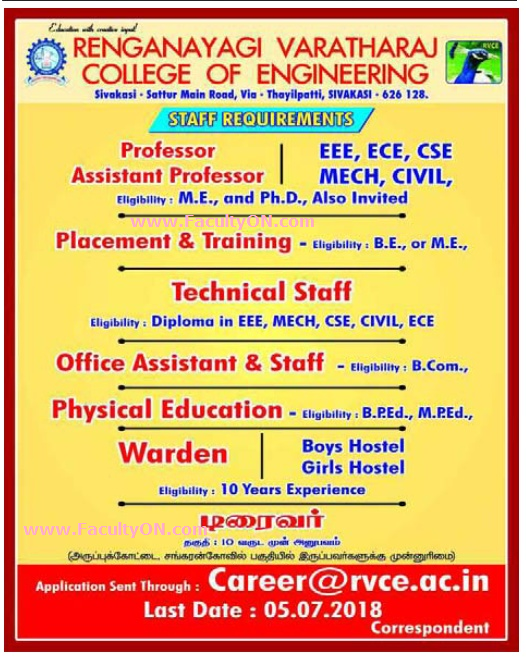 About College: Renganayagi Varatharaj College of Engineering (RVCE) was established in the year 2011, is a private Self financing Engineering institution approved by AICTE, New Delhi and affiliated to Anna Universityty, Chennai. The College is ideally located in a sprawling campus of 26.82 Acres, in SALVARPATTI Village, Sivakasi Taluk, and Viruthunagar – Dist. Well connected by buses from Sattur, Virudhunagar, Sivakasi, Kovil patti, Madurai, Thirunelveli, Rajapalayam, Srivilliputhur and Sankarankoil. The college is offering five Under Graduate and two Post Graduate courses (CSE and ECE).